Barron’s plans to cover this burgeoning style of investing on a more regular basis. A lot of possible content that was developed was left on the cutting room floor, the editors note. 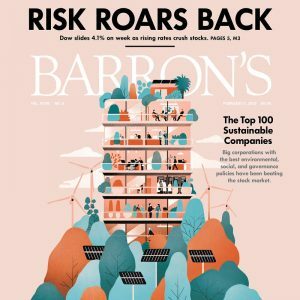 Think of this as proof of concept: The S&P 500® Index Companies returned 22% for the year 2017 and the Barron’s Top 100 Sustainable Companies average return was 29%. The 100 U.S. companies were ranked in five categories considering 300 performance indicators. Barron’s asked Calvert Research and Management, a unit of Eaton Vance, to develop the list of the Top 100 from the universe of 1,000 largest publicly-held companies by market value, all headquartered in the United States. and Thomson Reuters ASSET4 unit. There were items considered in the “shareholders” category, like accounting policies and board structure; employee workplace diversity and labor relations; customer, business ethics and product safety; planet; community; GHG emissions; human rights and supply chain. We can say here that “good governance” (the “G” in ESG) is now much more broadly defined by shareholders and includes the “S” and “E” performance indicators (and management thereof), not the formerly-narrow definitions of governance. Senior managers and board, take notice. Every company was ranked from 1-to-100, including even those firms manufacturing weapons (these firms are usually excluded from other indexes and best-of lists, and a number of third party recognitions). The Top 100 list has each company’s weighted score and other information and is organized by sector and categories; the complete list and information about the methodology is found at Barron’s.com. The Most Sustainable Financials (Northern Trust is #1) – Barron’s notes that there are few banks in the Top 100. Exceptions: PNC Financial Services Group and State Street. Familiar companies names in the roster include Adobe Systems, Colgate-Palmolive, PepsiCo, Deer, UPS, Target, Kellogg, Apple, and Henry Schein. Singled out for their perspectives to be shared in the Barron’s feature commenting on the ESG trends: John Wilson, Cornerstone Capital; John Streur, Calvert; Calvet Analyst Chris Madden; Paul Smith, CEO of CFA Institute; Jon Hale, Head of Sustainability Research at Morningstar. Top-ranked Cisco is an example of quality of management and management of risk: The company reduced Scope 1 and 2 GHG emissions by 41% since 2007 and gets 80% of its electricity from renewable sources. This is a feature article by Leslie P. Norton, along with a chart of the Top 100 Companies. The complete list of the top companies is at Barron’s com. (The issue is dated February 5th, 2018) You will need a password (for subscribers) to access the text and accompanying chart. On October 11, 2017 important news was coming from the Securities Exchange Commission (in Washington DC) for corporate leaders and investment professionals: a comprehensive package of proposed changes (amendments) to existing rules for corporate disclosure and reporting was released for public examination and comment. There are more than 250 pages of proposed changes and adjustments released for your reading (the document will be published now in the Federal Register for broad communication to stakeholders). You’ll remember the April 2016 activities as SEC released a 200-plus page Concept Release that addressed a range of issues that could result in revamping the overarching parts of Regulation S-K and parts of Regulation Fair Disclosure (“Reg FD“) and other corporate disclosures required by Federal statutes. We told you about this in our post of May 13, 2016. There were great hopes raised when the Commission in circulating the Concept Release document devoted more than a dozen pages to discussion about ESG, sustainable investing, the possibility of “guidance” or perhaps amending rules to meet investors’ expectations that public companies would begin, expand, improve on, ESG disclosure. Numerous investor interests provided comments to the SEC in support of the possibilities raised by SEC in the dozen pages of the Concept Release devoted to ESG et al. The US SIF — the Forum for Sustainable and Responsible Investing, a very influential trade association of asset owners and managers — provided important input, as did the CFA Institute (the U.S.-based, global certification organization for financial analysts and portfolio managers worldwide). Disclosure of material ESG issues was a key concern of the numerous responders in the public comment period. The proposed amendments were characterized as part of the overall, long-term review of the SEC’s disclosure system. Thus, the SEC said the proposed amendments reflect “perspectives developed during the staff’s broader review…including public input on the prior Concept Release. You have 60 days of open comment period ahead during which to express your views on the proposals. • Change such items as Description of Property**; the MD&A; Directors, Executive Officers, Promoters and Control Persons; Compliance with Section 16(a) of the Exchange Act; Outside Cover Page of the Prospectus. • Revise rules and forms to update, streamline and improve the SEC disclosure framework by eliminating risk factor examples listed in the disclosure requirement and revising the description of “the property requirement” to emphasize the materiality threshold**”. Note that while “property” is usually a facility, this does not always apply to the service sectors. • Incorporate technology to improve access to information requiring data tagging (XBRL) for items on the cover page and use of hyperlinks (HTML) by reference and in the EDGAR system. Again – the public now has 60 days to submit comments on the proposed amendments (to such statutory authority as the Securities Act of 1933; Securities Exchange Act of 1934; Investment Company Act of 1940; and, regulations under these landmark securities protection laws of the land). Disappointing News: There is no mention that we could find in the proposal document that addressed the many comments that were directed to the SEC staff in response to the earlier Concept Release by sustainable & responsible investor interests. And, in many investor conversations with SEC staff that acknowledged the growing importance of disclosure regarding corporate sustainability and ESG performance. No mention of: Climate Change. ESG. Responsible Investment. This is very troubling — no doubt members of the investment community and corporate leaders well along on their sustainability journey will be providing their perspectives to SEC — and the media, and elected officials — on this important oversight. SEC guidance for corporate reporters regarding their ESG, sustainability, responsibility, citizenship, etc disclosures and reporting activities would be very helpful – right? Of course, we are in a new political environment now, and perhaps that is helping to shape the agenda at the Commission as “reforms” are drafted and distributed for public consumption. There is much more news to come when the response to the announcement begins. Stay Tuned! P.S. – if you/your organization responds to the draft proposals, please do let G&A know so we can publicize your perspectives. Musing About the Alphabet Soup of ESG – SRI – CSR … et al! Often in our conversations with managers at companies that are new to corporate sustainability and especially new to publishing corporate sustainability reports, we often move into exploration of the various terms and titles applied to corporate sustainability. SRI. ESG. Sustainability. Corporate Citizenship. Corporate Responsibility. Or, Corporate Social Responsibility. Shorthand: CSR, CR. What else! And on the investment side, in our discussions with financial analysts, or asset managers, we’re discussing socially responsible investing, sustainable & responsible investing (both SRI) and more recently, sustainable & responsible & impact investing — the “S&R&I”). This alphabet soup of titles, characterizations, approach classifications and so on is usually confusing to corporate managers not well versed in matters related to corporate sustainability. And, to investors new to sustainable investing, sustainable & responsible investing, impact investing, analyzing corporate ESG analytics…those managers also have questions on what all these terms really mean (And ask: is there a substantive difference between terms?). Many institutional investor — asset owners and their managers, and their analysts — are seeming to favor “ESG” because it better captures the entirety of the three main issues buckets (Corporate Environmental, Social and Corporate Governance strategies, performance and issues) that make up what most investors consider to be a pretty good definition of corporate sustainability. As corporate sustainability consultants and advisors, working closely with managements to help them effectively engage with investors on ESG issues, and so we see the term ESG becoming more and more of a preferred term for these discussions. Consider, too, the familiar Bloomberg terminal on the desks of many investors is helping to bring volumes of corporate ESG data through the Bloomberg ESG Dashboard. The CFA Institute, the global education, training, testing and certification, and professional standards organization for financial analysts (“Charterholders” use the CFA professional designation) addressed this alphabet soup in its recent guide for investment professionals — “Environmental, Social and Governance Issues in Investing” (published in 2016). E: Looking at the environmental components (the “E”), CFA Institute, investor concerns include climate change and fossil fuel assets [becoming stranded], water stress…that means that corporate ESG KPIs should be carefully examined. S: Looking at the social (“S”), the authors point out that labor relations can have a direct and significant impact on financial performance. G: Looking at corporate governance (“G”), the authors note that these were previously seen as a concern for value-motivated investment, and the E and S issues were relevant mainly for values-motivated investors. Not anymore — ESG issues are relevant for all long-term investors. The CFA authors explain that there are various labels for the same issues and ESG common theme underlying the various labels is an emphasis is on ESG issues. We Are Leaning in the Direction of…. In our work we prefer to use “Sustainability” or “ESG”, which we think best encapsulates the entirety of what we consider to be the issues in focus for institutional and individual investors. And therefore we advise that the company’s ESG key performance indicators should be a priority concern for the board, C-suite and various level of management and corporate function areas, because of the importance of access to capital, cost of capital, and so on. The corporate ESG performance and reporting on same might be positioned under an oversight umbrella in the corporate structure. We see these ESG activities being in the province of legal, public affairs, human resources, supply chain management, operations, EHS, investor relations, finance, corporate communications, and so on. At times, however, we do find that some people in the corporate community hear the term “Sustainability” they automatically think only of environmental-related issues — (“E”) which of course, are just one part of what we consider sustainability to be. And yes, all of this is still not clear cut, is it? Varying terms and titles will probably be used for a while. And the clearer we can be with our terminology, and more specific, the better off we will all be. But Investors Are Not Asking…. We agree with Erika! And this line of discussion points even more to the problems with our terminology in this space. Of course, even though the analyst may not be asking: “Hey, so what about your sustainability?” the analysts and asset managers on your calls may be or are asking about the individual elements that make up sustainability, and some of these ESG KPI’s are more important than others. It’s important to recognize that these are Sustainability issues that they are asking you about! All of this terminology discussion is our industry’s challenge, and somewhat of an educational problem in that we need to better inform others about the intricacies and the complexities that make up “Corporate Sustainability” so that there is deeper understanding of the full breadth and depth and importance of the ESG performance areas — and of the full impacts on a company’s reputation, valuation and more. Of course, there are variations in which of these ESG issues is important (or material! ), depending on industry and sector, size and geography. We think that as we move along, “ESG” will continue to be a more preferred term for many analysts looking holistically at a public issuer. ESG will likely to continue to catch on because this approach will more clearly reflect the “completeness and complexity” of the various issue buckets that make up the corporate sustainability journey – ESG represents what it means and says what it is! Looking back, the emergence of the Socially Responsible Investing approach (SRI #1), starting with screening out the shares of companies from portfolios (tobacco, gaming, etc.) may have a lasting legacy for some in the investment community. More and more investors are now using the term, Sustainable & Responsible Investing (SRI #2), and even Sustainable & Responsible & Impact Investing (SRI #3 also!). These are gaining currency in the mainstream analyst and asset management communities. It was about ESG – SRI – CSR – even TARP (remember that?) — in that almost a decade-ago column, we noted that a 2008 survey of asset owners and managers, two terms were emerging as the preferred references: ESG and Sustainability best summed up their approach. We think this still rings true today. What are you thinking about this? Do weigh in — please share your thoughts in the comments area below — weigh in on the dialogue! What are your preferred terms in the daily conversation about…….